Germany’s Qiu Dang and Frenchman Andrea Landrieu were the players to upset the order of merit as the group stage of the Men’s Singles event at the Seamaster 2018 ITTF World Tour Asarel Bulgaria Open in Panagyurishte came to a close on Wednesday 15th August; however, they were not necessarily the players to attract the attention. The name that stood out from the crowd was that of Italy’s Mihai Bobocica. 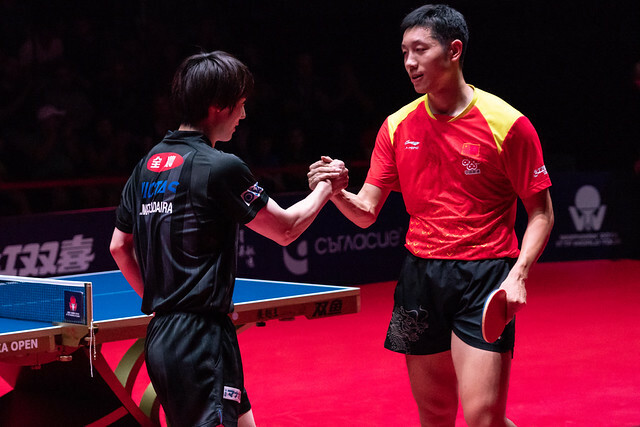 Listed at no.214 on the current Men’s World Rankings, Qiu Dang accounted for Slovakia’s Lubomir Pistej, named at no.59 (7-11, 5-11, 11-6, 14-12, 15-13, 11-3) to cause a major upset, conclude the group unbeaten and in first place. Similarly, Andrea Landrieu caused a surprise. He beat Paraguay’s Marcelo Aguirre (11-6, 5-11, 9-11, 11-8, 11-8, 12-10) to maintain his unbeaten record and thus reserve top spot; presently in the global order Andrea Landrieu appears at no.143, Marcelo Aguirre at no.106. Success for Andrea Landrieu but it was the defeat of his colleague, Antoine Hachard that attracted the attention; he was beaten by Mihai Bobocica in five games (12-10, 11-8, 10-12, 11-5, 11-9). Accepted there is a gap in ranking; Mihai Bobocica is listed at no.91, Antoine Hachard at no.180 but the Frenchman is a player in form. Just three days earlier he had contested the Men’s Singles final at the 2018 ITTF Challenge Seamaster Nigeria Open. Defeat for one player who had been on duty last week in Lagos, for another Finland’s Benedek Olah, who had suffered a seven games quarter-final reverse at the hands of Thailand’s Supanut Wisamthangkoon, it was success. In all Nordic group which originally included Denmark’s Michael Maze who had to withdraw injured, Benedek Olah beat Sweden’s Victor Brodd (11-6, 4-11, 11-7, 11-9, 11-5) to reserve first place. On the current Men’s World Ranking, Benedek Olah is listed at no.93, Viktor Brodd at no.195.